In a music competition focused solely on vocal chords, a student-led ensemble from St. Olaf took top honors. 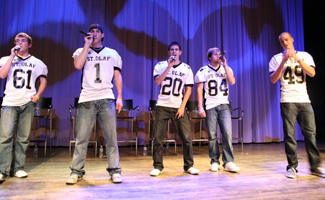 The Limestones, an eight-voice male a cappella group that has been a fixture at St. Olaf for more than two decades, won the 2010 Battle of the A Cappella Bands at Concordia College in Moorhead. The ensemble beat groups from Concordia, Saint John's University, and the University of Minnesota to take first place. This is the third year that Concordia has held the competition, and last year the Limestones finished second. In addition to taking top honors this year, the Limestones also earned awards for Best Group Vocals and Best Arrangement (for Teenage Dream/The Way You Are, arranged by Matt Sander '11). Current members of the Limestones include Sander, Jake Garin '11, Justin Luthey '11, Isaac Lewis-O'Connor '11, Cody Allen '11, Ryan Nash '13, Paul Mori '13, and Peter Kovic '13.